University of California President Janet Napolitano visited Manual Arts High School in Los Angeles today (Feb. 4) to speak with parents, students, teachers and counselors as part of a concentrated effort to raise awareness of UC’s accessibility and affordability. Managed by the nonprofit LA’s Promise, Manual Arts aims to prepare students for college and future careers, while providing a solid education. In support of the UC plan to increase enrollment of Californians by thousands, Napolitano is expanding the Achieve UC program to involve more families and community organizations after three years of it being offered in schools. The mission of the program is to inspire students to become UC-bound, while providing the practical guidance and resources for them to realize their educational goals. Nearly 50 Achieve UC events are scheduled between now and the end of April, including career fairs and community functions, as UC forms additional partnerships with local organizations. “Wherever they’re from, whatever their background, students need to understand that attending a UC campus is not a distant dream,” Napolitano said. “It’s possible and affordable, as long as students work hard. 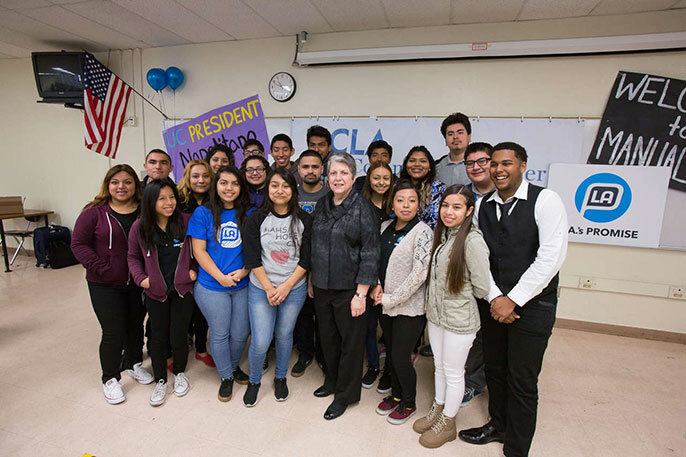 Since becoming president in the fall of 2013, Napolitano has spoken to hundreds of students at high schools throughout the state and will continue those visits in the next few months. Last fall, she engaged with faith-based and business leaders in Los Angeles; afterward, she directed UC Office of the President staff to expand community engagement efforts statewide, in partnership with campuses. Students are often surprised by the many options for financial assistance available to them, Gullatt said. In fact, more than half of UC undergraduates who are California residents pay zero tuition, thanks to an array of grants, programs and scholarships. UC’s Blue and Gold Opportunity Plan, for example, covers the full cost of tuition for students whose families earn less than $80,000 a year.